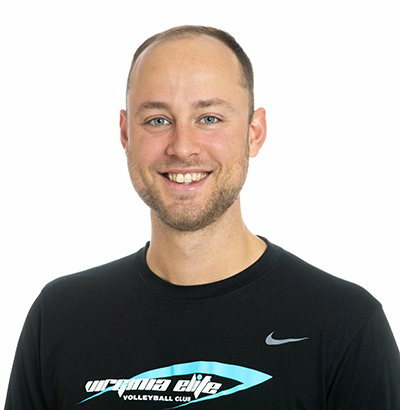 Ross Brickelmaier enters his fifth season with Virginia Elite as the head coach of the 18’s team after playing and coaching competitively for two decades. He previously coached multiple 16’s, 17’s, and 18’s teams with Longwood Volleyball Club and Arlington Elite Volleyball Club, where he also served on the executive board. Originally from Alamonte Springs, Florida, Brickelmaier began his playing career as a setter at Longwood Volleyball Club and for Lyman High School, where he captained his team to an FHSAA state title in his senior year. Brickelmaier then went on to play four years of club volleyball at the University of Central Florida, contributing as both as a libero and middle blocker. He has been an active player on the PVL CHRVA roster since the team’s initial inception and he travels along the east coast to play in competitive sand tournaments during the summer months. Brickelmaier spent a year playing indoor and sand for Bournemouth University and indoor for Wessex Volleyball England. While living in England, he trained with some of Europe’s most elite players, including members of England’s National Beach Team. Ross currently resides in Washington, D.C. and continues to play on a men’s USAV team. He earned a B.S. in Psychology from the University of Central Florida and a Master of Business Administration from Bournemouth University.